include; Celebrate Canada Day at the Taste of Vermilion on June 29, Art in the Park on September 8, Savor Vermilion on November 23, and Candy Cane Countdown in December. 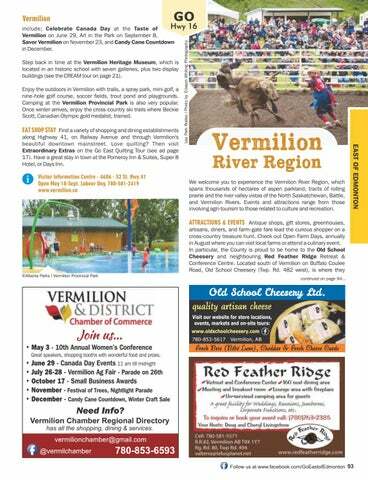 Step back in time at the Vermilion Heritage Museum, which is located in an historic school with seven galleries, plus two display buildings (see the CREAM tour on page 21). Enjoy the outdoors in Vermilion with trails, a spray park, mini golf, a nine-hole golf course, soccer fields, trout pond and playgrounds. Camping at the Vermilion Provincial Park is also very popular. Once winter arrives, enjoy the cross-country ski trails where Beckie Scott, Canadian Olympic gold medalist, trained. We welcome you to experience the Vermilion River Region, which spans thousands of hectares of aspen parkland, tracts of rolling prairie and the river valley vistas of the North Saskatchewan, Battle, and Vermilion Rivers. Events and attractions range from those involving agri-tourism to those related to culture and recreation. EAT SHOP STAY Find a variety of shopping and dining establishments along Highway 41, on Railway Avenue and through Vermilion's beautiful downtown mainstreet. Love quilting? 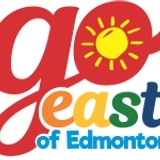 Then visit Extraordinary Extras on the Go East Quilting Tour (see ad page 17). Have a great stay in town at the Pomeroy Inn & Suites, Super 8 Hotel, or Days Inn. Great speakers, shopping booths with wonderful food and prizes. Need Info? Vermilion Chamber Regional Directory has all the shopping, dining & services.